Pierce potatoes with fork; place on microwavable paper towel in microwave oven. Microwave on High 8 to 10 minutes, turning after 4 to 5 minutes, until tender. Let stand about 5 minutes until cool enough to handle. Cut potatoes in half lengthwise. Scoop out about 2 tablespoons of pulp from center of each half; place in medium bowl. Reserve potato shells. Mash potato pulp with fork. Stir in sour cream; set aside. Meanwhile, in 10-inch skillet, cook beef, salt and pepper over medium-high heat 5 to 7 minutes, stirring frequently, until beef is thoroughly cooked; drain. Stir in corn, tomato sauce, onions and tomato. Cook 3 to 4 minutes, stirring occasionally, until hot and bubbly. 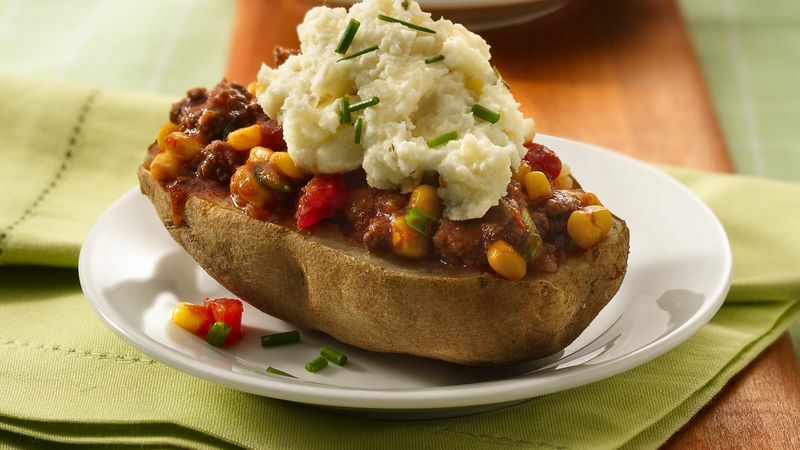 Spoon beef mixture into potato shells. Top each with about 1/4 cup potato and sour cream mixture. Place on microwavable platter. Microwave uncovered on High 4 to 6 minutes or until thoroughly heated. Serve immediately. Top with chives. Baking potatoes have low moisture and high starch content. Known as russet or Idaho potatoes, they are characterized by their long, slightly rounded shape and rough brown skin. If you can't find chive-and-onion sour cream potato topper, plain sour cream will do.